Realtors - Click here to read a special report! Knowing how to get real estate listings, and lots of them, is key to every Realtors' success! The more you have the more money you'll make. Simple enough, but how do you get them? calling friends and relatives, etc. And while these are good strategies are they enough? Do you you get as many listings and close as many sales as you need in order to earn a good living? No? Well, why not work smarter than harder...like by Farming Expired Listings! The most successful Realtors and Real Estate Agents tend to have "lead generating systems" ...like Farming Expired Listings. 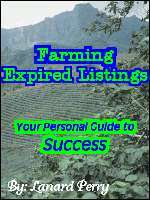 Farming Expired Listings will help you generate listings, one after another, week after week, month after month. And with its' "laser beam like focus" each prospect will be a warm, responsive seller. Leveling the Playing Field. If you had to throw away all but one of the business building tools that you have and keep just one I'd recommend keeping the "real estate listing system." Why? Because when you have listings you'll make money, no matter who sells them. With a good listing system you'll create an army of agents working for you day and night. Working to get you paid, even when you're vacationing, volunteering at your child's school, chaperoning a field trip, getting a haircut, or having your nails done! feel empowered to turn down bad listings and still average 1 or more listings a week. by signing up for my mailing list. You'll receive a once a week publication containing about real estate marketing tips, tools, resources, supplies, and ideas to help you increase your income. "You'll earn more when you learn more!" Please know that I will never share your email address with anyone and you can unsubscribe by simply clicking a link at the bottom of all messages you receive from me - automatically and without ever needing to request it! Here's What You'll Get When You Order The Farming Expired Listings Real Estate Listing System! These letters will have property owners calling you to list their properties. The listing system/letter combination is so effective you can turn down bad listings and still average 1 or more listings a week. Here are the Letters you get! The log will position you to appear as if the property of the person calling is the only property that you just happen to be reading about – whenever they call. Ask one simple question and within seconds be able to recall the specifics of the caller's property – even if you've never seen the property! The Marketing Report form streamlines the process of keeping all of your listing clients informed of your efforts to sell their properties. Generally, many agents do a great job of marketing properties, but a poor job of informing their sellers of their marketing efforts to get their properties sold! With this Marketing Update Report you can keep your sellers informed and happy, with minimal effort! It's simple, effective and a great time saver! Bonus #4 The Best Marketing Book I've ever read! (Priceless) This book is about Affiliate Marketing, but it applies to all kinds of marketing, including real estate internet marketing. It's 200 plus pages of the best information I've ever read about how to build a real estate agent web site right the first time, the importance of real estate web site content and how the search engines and site visitors love great web site content. And in case you don't already know it you need your own web site to be considered a serious real estate agent in your community. And perhaps the best part of all is the price! You get all of this for $134.00! $57.00. And you get it with a 90 Day Unconditional 100% Satisfaction Or Your Money Back Guarantee! Plus, you'll receive the entire package within seconds of ordering. So, you'll be able to get started right away! So, now for the money question! Is it worth one hundred and thirty four bucks fifty seven dollars to become a top real estate listing agent in your area, to systematically have listings coming in on a weekly basis, to generate more sales and make some serious money? If yes then you need The Farming Expired Listings Real Estate Listing System! You too can experience the success that I had and that others are having using this system and you get to try it RISK FREE! Your order comes with a 90 Day Unconditional 100% Money Back Guarantee! And if you are dissatisfied with your purchase for any reason I'll immediately refund 100% of your money with no questions asked. INSTANT DOWNLOAD! Order now and download immediately! Once your credit card is approved you will be taken to a special download page within seconds of ordering. When you get there you will be able to download the e-book and FREE Bonuses immediately! The E-book and Bonuses are delivered via zip file. The e-book is a PDF document and the letters are Microsoft Word. WinZip, Acrobat Reader are required. Your order comes with instructions on how to download these utilities FREE in case you don't already have them. P.S. It's normal to have questions about how good this product is. But at the very least review it and then make your decision. You can always return it if you want - no questions asked. Also, if you decide to look for other options I can understand and respect that. But do yourself a favor and bookmark this site before you leave, because after you see what other products are available you’ll want to come back to this site again. Also - be sure to sign up for our FREE Sample Chapter by clicking here before you go.